One of the best parts about doing research on artifacts we find during CAP excavations is coming across incredible stories or histories that stem from what some people would consider mundane and ordinary objects. Such is the case with a seemingly ordinary piece of a plate recovered from the Brody/Emmons Complex. 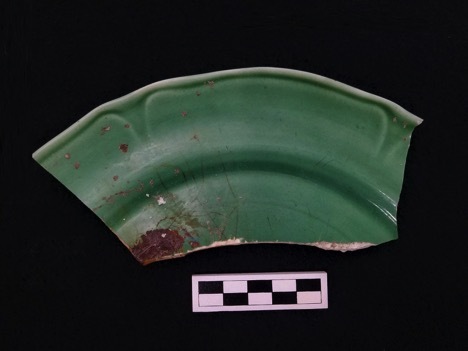 The plate sherd (Figure 1) is about 15cm long and 7cm deep and is a from a pleasant jade-colored plate. Since only the rim and part of the base are present, the portion with maker’s mark (which is usually centrally located on the underside) is not there. However, the design of the plate itself hints at its origins. Around the rim of the plate is what appears to be a petal design such that when whole, the plate would quasi-resemble a big flower. Based on this rim design, it is most likely that this plate is part of the Petal style from the Mount Clemens Pottery Co., made right here in Michigan. The Mount Clemens Pottery Co. has its origins back in the 1910s in the aftermath of an area-wide economic depression in the Mount Pleasant area [1, 2, 3]. A local businessmen’s association looked to economically boost the area and traveled to pottery factories in Ohio and Pennsylvania and looked at how these different companies produced their wares. After a few years preparation, production officially started in 1915 in a warehouse built on an old farm. By the end of the first year, over 36,000 pieces per week were produced . The Petal style seen by the plate discovered at the Brody/Emmons Complex was mostly produced during the 1930s. Right after this period, the company became embroiled in a legal battle that still has ramifications today. 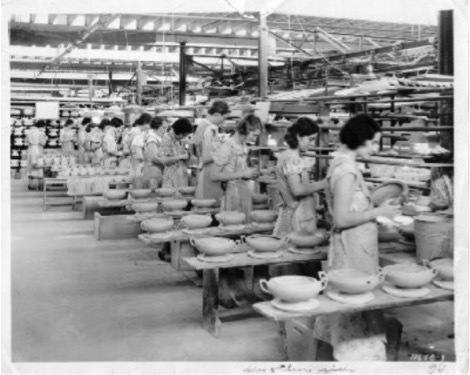 Workers at the Mount Clemens Pottery Co. producing casserole dishes, 1924. Image source. In 1941, workers were being docked pay for the time between when they clocked in and when they started work due to long prep time before they would actually start working. Workers had to clock-in, walk a long way down to their work stations (the factory was 8 acres large), and prepare their work station before finally starting work [1, 4]. The workers filed a class-action lawsuit (Anderson v. Mount Clemens Pottery Co.) claiming that the company was unfairly docking their wages and violating the Fair Labor Standards Act. The district court ruled mostly in favor of the company and that it was up to the employees to prove that needed to be compensated for their prep time, although they did require the company to pay the workers over $2000 in back-pay. The workers then appealed the decision which made its way all the way up to the United States Supreme Court . They remanded the case back to the lower courts with the strong recommendations that it was up to the employers, not the employees to provide the proof for such decisions. This led to the creation of the “Portal to Portal Act” in 1947 which defined work time as the time you entered the workspace to the time you leave it, and it is then up to the employer to justify docking wages within that timeframe . These court cases have been revisited and used over the years, most recently in Tyson Foods v. Bouaphakeo in 2016 where workers claimed that the company was unfairly docking wages for the time it took them to put on the protective gear needed for processing pork. After the case was settled in 1946, Mount Clemens Pottery Co. still had issues with workers but things eventually stabilized. The factory permanently shut its doors in 1986 after sales plummeted. Researching these histories lets us rediscover the stories that otherwise are unknown to us. What seems to be just a normal plate is actually symbolic of workers’ right that still have lasting effects into the 21st century. Doll, C.E., 1993. The Mount Clemens Pottery Company: History and Memories. Goldberg, H.M. et al., 2014. When Does Compensation for “Time Spent Under the Employer’s Control” Include Pre and Post Shift Waiting and Other Activities?. Southern Journal of Business and Ethics; vol. 6:33-45. Very interesting article. Too bad so many jobs were lost when the pottery company closed. Perhaps check the area antique shops for remaining plates. This is a most interesting story. Thank you for sharing it with us.